NASA photo of Apollo 8 launch. The pioneering work done in the 1960s by employees of what was then Collins Radio in Cedar Rapids is the subject of a documentary premiering this week. “Moon Talk” tells the story of the technology developed at Collins that enabled astronauts aboard the Apollo 8 Moon mission to speak with Mission Control. Retired systems engineer Steve Tyson says the company’s contributions were critical. Apollo 8 launched 50 years ago this week — on December 21st of 1968. 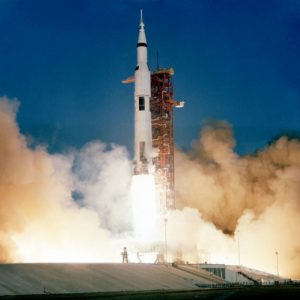 It became the first manned space flight to leave Earth’s orbit. Astronauts Frank Borman, Jim Lovell and Bill Anders circled the moon ten times. Tyson says it’s an aspect of space history he didn’t fully appreciate. “I worked for Collins for 22 years and never realized the magnitude of the amount of work that went on and the magnitude of the contributions that these folks, Art Collins and these people, made back then,” Tyson says. A free showing of “Moon Talk” will be at the Collins Road Theatres in Marion Friday morning at 11:30. Known for decades as Rockwell Collins, the company was purchased last month by UTC Aerospace Systems and is now known as Collins Aerospace. With about 9,000 workers, it’s Cedar Rapids’ largest employer.